The Eastern Arabic numerals (also called Arabic–Hindu numerals, Arabic Eastern numerals and Indo–Persian numerals) are the symbols ( ० ۱ ۲ ۳ ۴ ۵ ۶ ۷ ۸ ۹) used to represent the Hindu–Arabic numeral system, in conjunction with the Arabic alphabet in the countries of the Mashriq (the east of the Arab world), the Arabian Peninsula, and its variant in other countries that use the Perso-Arabic script in the Iranian plateau and Asia. These numbers are known as أرقام هندية (ʾarqām hindiyya, "Indian numbers") in Arabic. They are sometimes also called "Indic numerals" in English. However, that is sometimes discouraged as it can lead to confusion with Indian numerals, used in Brahmic scripts of India. Each numeral in the Persian variant has a different Unicode point even if it looks identical to the Eastern Arabic numeral counterpart. However the variants used with Urdu, Sindhi, and other South Asian languages are not encoded separately from the Persian variants. See U+0660 through U+0669 and U+06F0 through U+06F9. Written numerals are arranged with their lowest-value digit to the right, with higher value positions added to the left. That is identical to the arrangement used by Western texts using Western Arabic numerals even though Arabic script is read from right to left. There is no conflict unless numerical layout is necessary, as is the case for arithmetic problems (as in simple addition or multiplication) and lists of numbers, which tend to be justified at the decimal point or comma. Eastern Arabic numerals remain strongly predominant vis-à-vis Western Arabic numerals in many countries to the East of the Arab world, particularly in Iran and Afghanistan. In Arabic-speaking Asia as well as Egypt and Sudan both kinds of numerals are used alongside each other with Western Arabic numerals gaining more and more currency, now even in very traditional countries such as Saudi Arabia. The United Arab Emirates uses both Eastern and Western Arabic numerals. In Pakistan, Western Arabic numerals are more extensively used as a considerable majority of the population is anglophone. Eastern numerals still continue to see use in Urdu publications and newspapers, as well as sign boards. In North Africa (excluding Egypt and Sudan), only Western Arabic numerals are now commonly used. In medieval times, these areas used a slightly different set (from which, via Italy, Western Arabic numerals derive). ^ Other Latin transliterations include Algaurizin. ^ "Glossary of Unicode terms". Retrieved 2 September 2015. ^ "Glossary". Retrieved 2 September 2015. ^ Menninger, Karl (1992). Number words and number symbols: a cultural history of numbers. Courier Dover Publications. p. 415. ISBN 0-486-27096-3. 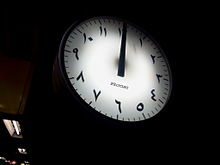 Wikimedia Commons has media related to Clocks with Eastern Arabic numerals.